Are You Aware Of Ransomware Attacks? In order for organizations to be safe from ransomware attacks, all employees must be educated about hacking and informed of the resources they can use to protect their data. Here are some measures everyone should take to be safe from malicious software. Keep your system software updated to ensure you have fewer vulnerabilities to exploit. Never install any unknown software on your system or give it administrative privileges. Keep a reliable and paid antivirus product in your system which detects malicious programs like ransomware as they arrive. Backup your files, frequently and automatically. Though it won’t stop a malware attack, but it can make the damage less significant. Should ransom be paid to the attackers? If your system has been infected with malware and your data is at risk, should you pay the ransom? Most law enforcement agencies urge you not to pay ransomware attackers because it encourages hackers’ attacks. According to research from Trend Micro, while 66% of companies agree to never pay a ransom as a point of principle, 65% actually do pay the ransom when they get hit. There are a couple of things to remember before you decide to deal with these cyber criminals. Firstly, what appears to be ransomware may not have encrypted your data at all, make sure you are not dealing with “scareware” before you send any money to the attacker. Secondly, paying the attacker does not guarantee that you will get back your data. Sometimes the attackers take the money and may not have even built a decryption functionality into the malware. The best way is to take precautions to minimize the impact of such attacks. To gain more knowledge for keeping your system safe, check out uCertify CompTIA Cybersecurity Analyst courses. “I had the pleasure to go through uCertify’s CySA+ training course. The course provides the skills required to pass the CS0-001 exam and helps you learn about logs, attacks, risks, and how to address these issues. To read the complete feedback, please click here. Thank you Kathleen for your valuable feedback! We are glad that you found our course helpful.To know more about Kathleen, contact via her LinkedIn profile. Posted in CompTIA, Customer Review, CySA+, Reviews. CompTIA Security+ is a globally recognized vendor neutral credential that validates the expertise of professionals to perform core security functions in an IT security career. Security+ certification focuses on the latest techniques in risk management, risk mitigation, threat management, and intrusion detection. It encompasses hands-on troubleshooting to ensure security professionals have practical security problem-solving skills and establishes the understanding required of any cybersecurity role. This certification is specially designed for the Systems Administrator, Network Administrator, Security Administrator, Junior IT Auditor/ Penetration Tester, Security Specialist, Security Consultant, and Security Engineer. CompTIA Security+ is the fundamental security certification that IT professionals must go for. To earn this certification CompTIA recommends that the professional has CompTIA Network+ and two years of experience in IT administration with a security focus. These domains covered in Security+ have become a baseline for all cybersecurity jobs. These days, organizations prefer Security+ certified employees as they help them mitigate expensive security threats. Security+ acts as a great stepping stone to other vendor-specific certifications and increases professionals’ value in a competitive industry. It helps them advance towards a rewarding career in security and IT system administration. The professionals with the Security+ certification receive a higher salary than their non-certified co-workers. On earning this certification, you can expect an average salary of between USD 42,130 and $95,830 as a network engineer and within a few years, the professional with this certification can earn about USD 66,890 per year. Interested in being CompTIA Security+ certified? Start your prep for the certification today with uCertify! Posted in CompTIA, Security+, SY0-501. “If you are planning to earn the CEH certification quickly, you can start your prep with the uCertify CEH v9 course. It comes with chapters, practice tests, and performance-based labs that simulate real exams. It also contains 100+ pre-assessment questions that can be used to measure your readiness for the certification exam. Thank you Willy for your valuable feedback! We are glad that you found our course helpful. To know more about Willy, please contact via his LinkedIn profile. Posted in CEH, Customer Review, Reviews. Last Day Today: Get Upto 30% Site-Wide Off! 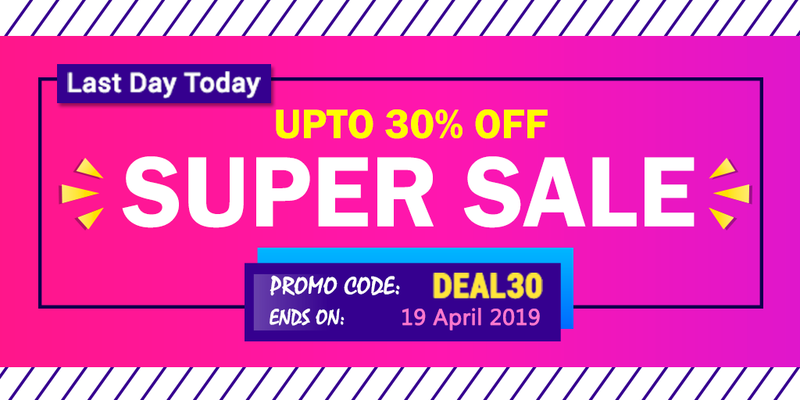 It is your last chance to avail 30% site-wide off at uCertify Super Sale! So, hurry up, check out our award-winning e-learning platform, pick up the right course for you, and start your prep. Don’t forget to use promo code while checking out.